Here is a perfect example of news buried by the media. For the first time ever, South Korea has been challenged under the Convention on the Elimination of All Forms of Racial Discrimination. 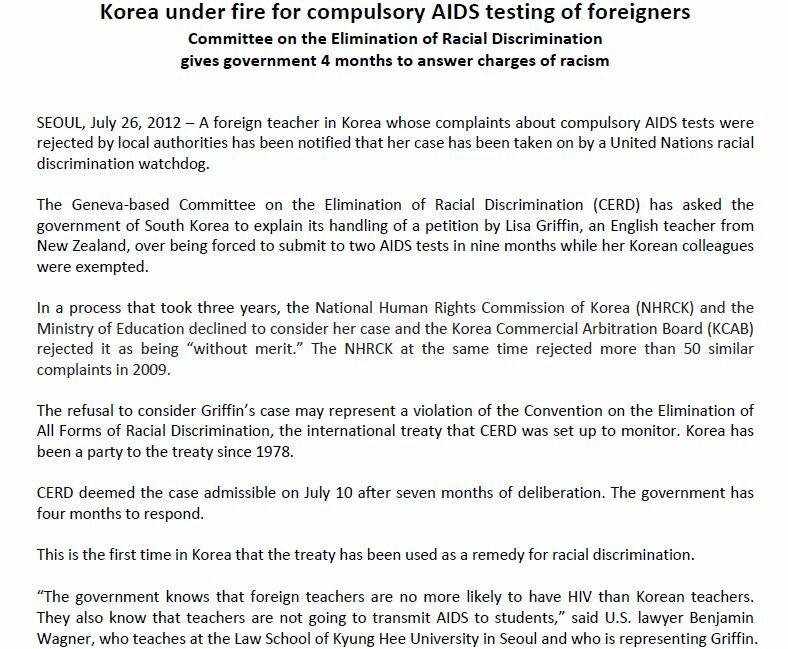 The repeated cases being turned down by the National Human Rights Commission of Korea (NHRCK) regarding foreign English teachers having to be repeatedly tested for AIDS has been challenged by the Geneva-based Committee on the Elimination of Racial Discrimination (CERD). And not one news source in South Korea has mentioned this momentous event. The investigative news blog Gusts of Popular Feeling has posted both the press release on this action, along with a translation in Korean. Here is the English version. ← Weird Sea Creature in Singapore? the second test was because immigration and the ministry of education are not in communication with each other. It has nothing to do with racial discrimination. Korean teachers that have been living abroad also have to take the same test. This is a ridiculous accusation. Yea korea is a racist country….but guess what? all countries are racist…. I am so glad I left. I spent several years, long enough to know what Korean culture really is, in Korea. The racism runs deep and some of its forms are subtle, but some beat you over the head. It wears you down slowly, until even you yourself start to forget what life was like when you were equal and seen in the same light as everyone else. Korea has a long way to go. If parts of the government arent communicating, then why is this the foreign teachers fault? 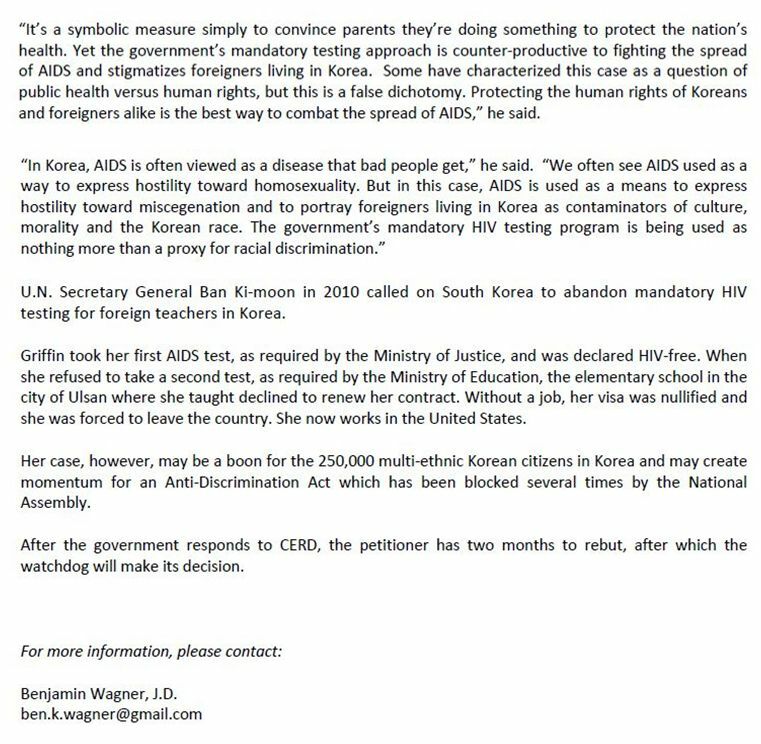 The way foreigners give up their rights in SK disturbs me. I know when in Rome do as the Rome do, but this is just wrong and Korean don’t have do half the crap we put up with in SK. Its like you read my mind! You seem to understand so much approximately this, like you wrote the guide in it or something. I believe that you could do with a few percent to pressure the message home a bit, however other than that, that is excellent blog. A great read. I will definitely be back.